Thunderball Grotto in the Exuma Cays is one of the best examples of Bahamian beauty. This wondrous destination combines the splendor of the country’s unique landscape with the thrill of the world of James Bond. Exploring this submerged cave will ensure that you take unforgettable memories home of your day trip to Bahamas. The Exuma Cays are made up of 365 islands, and many more sites and attractions. Thunderball Grotto is among the most beautiful. In close proximity to Staniel Cay Bahamas, the jewel in the crown of the Bahamas, Thunderball Grotto is easily accessible. This is important because with Bahamas Air Tours you can choose to embark on a Staniel Cay day tour. You’ll be able to visit a number of extraordinary sites on your trip, including the marvelous Thunderball Grotto. Bahamas Air Tours offers a range of packages that will ensure you have the trip of a lifetime. If you’re a busy Floridian with little time to spare, then you can take advantage of the day trip option. Enjoying a Bahamas island hopping tour has never been so easy. You will be able to explore all the wonderful things to do in Exuma Bahamas. With Bahamas Air Tours, not only will the “how to get to Exuma Bahamas” question be taken care of, but your transport from destination to destination will be too. If you’ve got a little more time on your hands, you can of course book overnight tours. This will give you a chance to see a little more of the Bahamas. In fact, if you want to upgrade your package to a private charter, then you can enjoy a custom tour with a group of friends and family with a range of added benefits. Of all the things to do in Exuma Bahamas, visiting Thunderball Grotto is among the best. Upon arrival in a speedboat from Staniel Cay Bahamas you will need to take the plunge. The reason for this is that the entrance to the grotto is actually submerged. 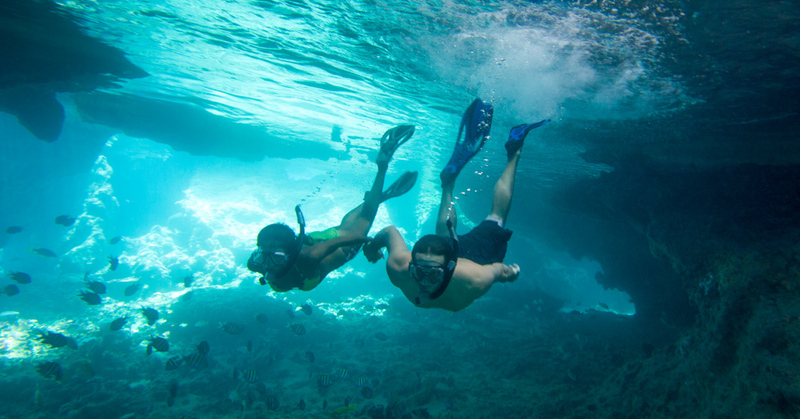 Snorkeling through the short tunnel you will find yourself in the mesmerizing Thunderball Grotto cavern. With a small hole in the roof of the cave, you will find your surroundings illuminated by the reflection of the turquoise water. Floating on your back will give you the stunning view of the shimmering cave, and floating face down will grant you a window into the beautiful underwater world. Fish dart between vibrant coral in the lively reef below you. Thunderball Grotto was named after the 1965 Bond film “Thunderball”. The site was actually used for one of the action-packed scenes in two of the Bond films, “Thunderball” and 1983’s “Never Say Never Again”. This isn’t even the only Bond themed site that you can visit on your Staniel Cay day trip. Staniel Cay Yacht Club even hosts an annual Casino Royale evening. In fact, experiencing this country with Bahamas Air Tours may even make you feel as if you’ve been transported directly into a Bond movie. Small aircrafts transporting you to pristine tropical locations where you can explore the landscape. Speedboats transporting you to Thunderball Grotto and other exciting destinations. All of this seems like it could have been pulled right out of a Bond storyline. A visit to Thunderball Grotto is essential on a Staniel Cay day tour. It is one of the top sites in the area and displays a unique beauty like nowhere else on earth. Even if you’re in the country for several days, you can book a Nassau to Exuma day trip with Bahamas Air Tours and experience the beauty that is Thunderball Grotto. Staniel Cay is just to the east of Thunderball Grotto. Though the beaches are pristine, and the accommodation is world-renowned, it’s the nearby attractions that make it one of the most popular islands in the Bahamas. A Bahamas tour of Staniel Cay and its surroundings is the best way to experience a Nassau to Exuma day trip. A Bahamas day trip of Staniel Cay will most likely include the famous swimming pigs. These delightful creatures have become the world’s most sought-after trip. Mere minutes from Thunderball Grotto you will find yourself face to snout with these adorable paddling pigs. Watching these porcine swimming out to meet you with the exquisite Bahamian landscape as a backdrop is quite comical. Once they reach your boat you should have some food at the ready to drop into their upturned snouts. After swimming alongside them for a while, or soaking up the Bahamian sun with these curious creatures around you, you can set out for one of the many other nearby attractions. If the idea of experiencing a James Bond lifestyle interests you, then you should undoubtedly visit the submerged plane wreck. Said to have belonged to a drug smuggler, this plane was found to be full of bags of flour, which was used during test runs. To see the wreck of a plane beneath the exquisite turquoise ocean really is a unique experience. This site will make an excellent addition to your Thunderball Grotto Bahamas tour. The beauty of the Exuma Cays does not end with Staniel Cay. In fact, this string of islands is so beautiful that a number of celebrities own private islands of their own. Johnny Depp, John Travolta, Faith Hill and Tim McGraw, Eddie Murphy, Nicholas Cage and several more have holiday homes in this stunning archipelago. The Exuma Cays are the perfect example of the Bahamas Out Islands. They should be one of the first destinations on your list. Most people spend their time in Nassau, without any idea of how to get to Exuma Bahamas. However, Nassau should be treated as little more than a gateway to the Exumas. In fact, with Bahamas Air Tours, there is almost no reason at all to waste your time in the Bahamas. Island hopping ensures that every single moment spent in this marvelous country is unforgettable. Each new island offers new and exciting attractions, with the entire trip feeling as if you’re in a James Bond film. With all of this in mind, it’s important to remember that Staniel Cay is undoubtedly the best of all the islands in the Exuma Cays. Surrounded by incredible sites such as Thunderball Grotto, there are endless things to do in Exuma Bahamas on your Bahamas day trip. Though you can choose to fly to the Bahamas and tour the islands by boat, nothing compares to what Bahamas Air Tours offers. You will find yourself transported to an enchanting world full of pristine beaches, turquoise water and sites like Thunderball Grotto. Bahamas Air Tours not only offers the unique opportunity to view the islands from above while island hopping, but also allows for speedy travel between destinations. What this means is that you can make the most of a Bahamas day trip. If, however, you intend to take some time exploring the islands, then you can also book overnight packages with Bahamas Air Tours. This will allow you to discover a comprehensive range of destinations in the Bahamas without feeling rushed. The wonder of flight combined with the beauty of the Bahamas makes for the perfect trip.